Rajnikant is not your typical narcissistic film star and his hands bear it out quite starkly. While the lowset Jupiter finger is the main indicator, there are other signs which emphasize Rajni’s simplicity, shyness, lack of vanity, and disinterest in living a showy lifestyle. Notice the short and fairly slim lower phalanges, two conic tips, three straight fingers and the joint life and headlines. self-esteem issues at a young age, more so before the age of thirty. In fact, his hand shows acute introversion in childhood and such people are not just sensitive, they are late bloomers. Perhaps this is the reason why fame did not go to his head - his inherent shyness and humility followed him into his adult years and kept him grounded. A hand image of his can be seen here. Some of Rajnikanth’s personality characteristics which changed, or rather developed, were to his advantage, like that of aggressiveness and creativity. An ability enhanced over and above what has been inherited is an indication of a self-made person. Such hands, where the natural ability of a person is developed almost from scratch is unusual in any hand and shows intense dedication to the craft, immense focus and hard work. These people have it harder than most because a conducive environment is usually missing. What this means is that family members do not possess similar talents, and are therefore unable to mentor the person. Many people with such developed abilities come from humble backgrounds although this is not always so. Interestingly, Baba or Swami Ramdev is another famous person who is entirely self-made. 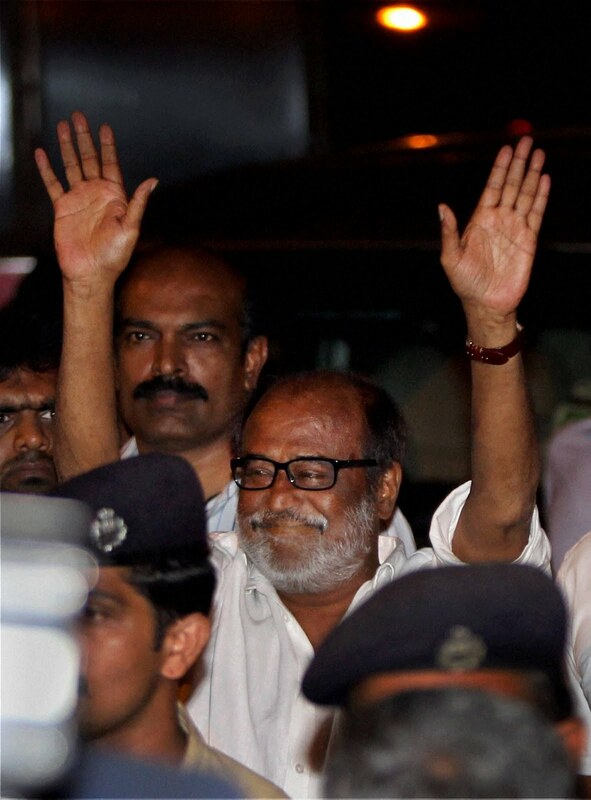 His hands, like that of Rajni's, show an enhancement of natural ability, in fact even more remarkable than Rajnikant’s. Ramdev's intellect and talent grew tremendously over what he had inherited, although Ramdev was never inherently humble or shy. A strong business mindset is shown on Rajnikant’s hands, perfectly acceptable in the hands of a commercial movie star. He may not be an intellectual but his hands show him to be extremely shrewd and aggressive, with a natural ability to evaluate people (Mercury finger) and handle money. His hands also show him to be a straightforward, broad-minded, and a cheerful and optimistic person who loves life. His hands are quite normal in every way, showing the normal passions, compassion and warmth and belong to a person who would be easy to get along with in his personal life. Moodiness is shown, but not melancholy. (Rajnikanth is a top Indian movie star, more famous in the South Indian Film industry). Hand readings of other Indian actors who are legends: The magic behind Rajesh Khanna's super stardom or Amitabh Bachchan's hand analysis or Rekha or the singer/actor Kishore Kumar. Or check out the rising Telugu star Prabhas Raju Uppalapati or Tamil star Kamal Hassan. You might like to read about Salman Khan, Aamir Khan, Aishwarya Rai, Rani Mukerji, the more established actors who work in Hindi cinema. Or check out the hand readings of movie Actors from all over the world, or specifically from Bollywood or Hollywood. There was a time (in the '90's) when his fame was at its peak. His preference for a political candidate became people's preference as well - He was so influential back then. Contrary to what people from other states believe, his sheen has decreased considerably (in TN, his home state) now. And he himself was the reason for it. His image as a superstar was carefully built by many directors, producers, script writers, song writers, etc. The whole movie industry benefited by having a Super Star. He always spoke the right things and did the right things on-screen. Style, was but a small factor. His success was more due to the philosophy of representing everything good. And eliminating the bad. In a movie, he can renounce all money and live a saintly life. But the reality is totally different, and you are right about his passion for money. The celluloid industry gave him everything - Fame, cult-status, large following, etc. He almost lost all of that due to his initial brush with politics. Fortunately (for him), he left it at that. DI, Thanks for your insights into Rajnikanth. Krishna, There is no such thing as an "M" in palmistry as far as I know. Each line has to be evaluated on its own. The reading depends on whether the main line is in its proper place, where it starts, where it ends, and its strength and quality. If you don't mind can you please read hand of Barun Sobti, he shot to fame with his serial Is Pyaar ko Kya Naam Do. As a actor he has broken all the records... would love to know your analysis on his hand...not sure if you can get a good hand print of him. Thanks for the suggestion, I will try and see if good pictures are available of his hands. Grt..bt mam could u tell me the effect of joint head line and life line? Well it depends on how joint it is. If it is only a little joint, it is perfectly normal. If it is joint for some length, then it can show some cautiousness and shyness particularly in the early years. Also one has to check whether there are any branches from the headline crossing the lifeline and entering the lower mars area. The meaning is then slightly different. In any case, I would advise you not to come to any conclusions by checking one sign. Personality characteristics are shown in several places on the hand, and some signs have more weightage, some have less. If there are parts of the hand which contradict this cautiousness that I mentioned, then one has to see how much of it is really present. I love your blog , its very informative. 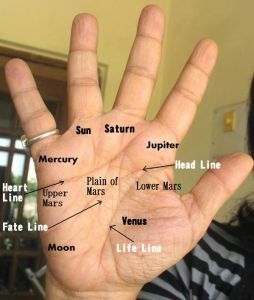 There are so many websites out there which gives information of palmistry. I m trying to gain knowledge about it and now sure which website gives the right information about it. I wanted to gain some insight about one line which they call " relationship lines". It runs across under the pinky (fifth) finger. They say number of lines you have determines number of marriages you have. I have 2 strong lines, does that show that I will have 2 marriages. Another thing is that, there is a small line running across one of the line, does that mean I will have relationship outside marriage?. That's what all the website says. Those lines do not tell you how many marriages you will have, not even the number of affairs! I know many people with 2 or 3 strong lines who have had only one marriage and they are in their eighties. Those so-called marriage lines are the most unreliable (for telling you about marriage) lines in palmistry. Also, there can be relationship "outside" marriage shown on the hand because marriage is not shown at all. Marriage is a legal document, and legal ceremonies are not documented on the hand. If you wish to know about relationships, look for influence lines joining the Fate line or influence lines on the Mount of Venus. Yes, I have read that, about the fateline being more significant on spatulate and square shapes. However I have never seen it actually borne out in practice. The hand itself is a reflection of one's inner self so the line's strength is what matters. It is how important that aspect of life is to oneself, in one's own mind. So a fateline and sunline has to be seen relative to the other lines. Children cannot be seen on the hand. If you want a reading please write to me on my email id given under the About Me section and I will send you the charges for the different types of readings available. Thanks.